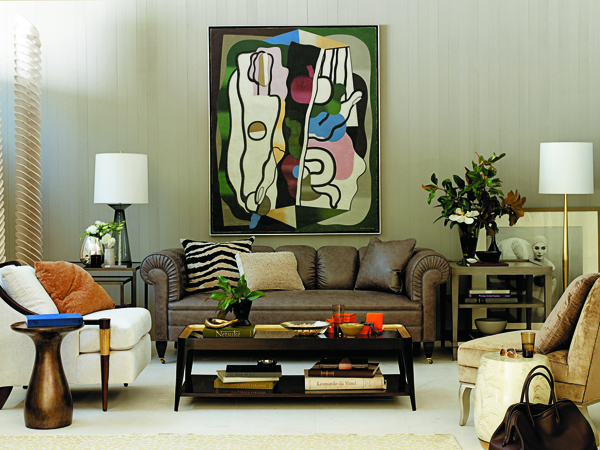 Baker Furniture speaks the language of style. Not satisfied to be of the moment, the company works to be of the movement, in the role of taste maker and innovator rather than a follower at the whim of fashion. The accent is on product – through Design, Materials, Craftsmanship, and Finish. At the beginning, a craftsman named Siebe Baker worked with his hands. Later, the success of his sturdy furniture allowed his son, Hollis Baker, to study at university, travel the Old World, and hone the eye of a collector. Today these two thoughts, the eye and the hand, remain the cornerstone of Baker Furniture. For our customers, they mean a sense of integrity and the promise of things chosen well rather than often. 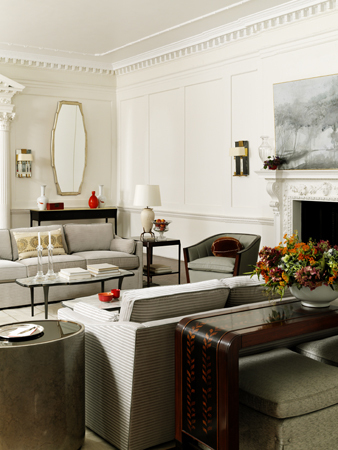 Good design lies at the heart of fine furniture. For Baker, that means a great collection assembled literally one item at a time. Baker builds furniture from more periods, styles, and international influences than any other maker. Whether a best of kind reproduction or an original from a celebrated designer, each item contributes to a sensibility that is uniquely Baker. Yet the company also selects each item for its own merit. With careful attention to scale, proportion, and ornamental detail, the line develops a rare sense of appropriateness. The result is furniture thought tempting today and timeless tomorrow. 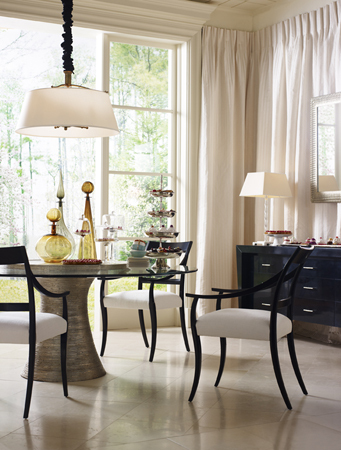 The Baker Design Legacy displays a complete history of notable design throughout the decades. From the days of the early cabinetmaker, the search for choice materials has been one of the more obvious, but also more difficult, ways to bring beauty and durability to fine furniture. Long regarded as one of the company's special strengths, Baker Furniture continues to buy solids and particularly veneers for each item individually. To this day, a senior executive has, as his primary responsibility, the selection of wood from boutique mills around the world. That effort allows Baker to work with wood superior in color, cut, character, and combination match. The resulting furniture has not only dramatic figure but also an appropriateness to the form that would otherwise be unobtainable. These differences mark the line between art and industry. While design and materials create a sense for the potential beauty of furniture, hand craftsmanship in all of its sundry forms determines the outcome. One of America's most honored designers has called Baker the equal of a dozen custom shops under one roof. We remain a cradle of skills elsewhere forgotten. Just as there are good antiques and bad antiques, there are all manner of carving, inlay, joinery, gilding, and so forth. Baker Furniture not only offers these techniques, but it does so through its own people, practiced in their trade and provided with the time to do good work. The result is furniture with a bit more refinement, a bit more obvious with each passing day. The search for beauty is often lost or found in the finish process. With that in mind, Baker still prefers an Old World method of hand coloring, an artist's palette of color applied with a smallish pad and a simple brush, one very thin layer at a time, applied and reapplied until pleasing to the eye. All of this creates a remarkably clear finish allowing us to not only see the wood selected for an item but see it in the appropriate context of color, breakup, highlighting, antiquing, and sheen. 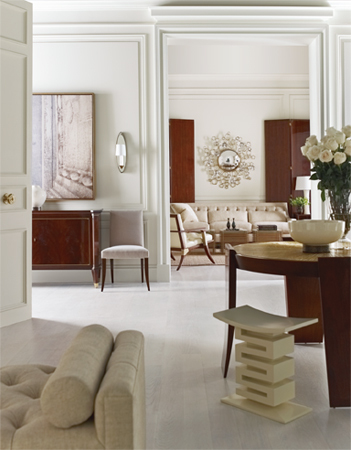 The collective effect of these techniques is to nurture and coax the full beauty of the furniture.